Fishing operations. 2. Best practices to reduce incidental catch of seabirds in capture fisheries. FAO Technical Guidelines for Responsible Fisheries. No. 1, Suppl. 2. FAO Technical Guidelines for Responsible Fisheries . No. 1, Suppl. 2. Rome, FAO. 2009. 49p. These Guidelines have been produced to support implementation of the International Plan of Action for Reducing Incidental Catch of Seabirds in Longline Fisheries (IPOA-Seabirds). They are addressed to decision-makers and policy-makers associated with conserving seabirds and with minimizing their interaction with fishing gears, but the Guidelines should also be of interest to fishing industries and other parties. The IPOA-Seabirds is consistent with the FAO Code of Conduct for Responsible Fisheries, agreements from the 1995 United Nations Conference on Straddling Fish Stocks and Highly Migratory Fish Stocks and any applicable rules of international law. It encompasses interactions of seabirds with all fishing gears, whether they are industrial, artisanal or traditional fisheries. The IPOA-Seabirds is not a full strategic plan for the world, rather it prescribes a process whereby individual States, States participating in subregional arrangements through bilateral and multilateral agreements to minimize the interaction of seabirds with fisheries, and relevant regional fisheries management organizations (RFMOs) identify national, subregional and regional issues and then develop national and regional "Seabird Plans" to address the issues. The guiding principles of the IPOA-Seabirds and the Guidelines are that States contributing to mortality of seabirds should participate in their conservation and management. The Guidelines are intended to provide general advice and a framework for the development and implementation of Seabird Plans and Seabird Monitoring and Assessment Reports prepared at national, regional and subregional levels. They are also intended to provide general advice and a framework for joint Seabird Plans in areas managed by regional fisheries management organizations and arrangements (RFMO/As). The Guidelines have been prepared to: (i) assist countries in preparing and implementing a more effective National Plan of Action for Reducing Incidental Catch of Seabirds in Longline Fisheries (NPOA–Seabirds); (ii) provide RFMOs with guidance on implementing an IPOA–Seabirds within a regional framework; and (iii) address incidental mortality of seabirds from relevant fishing gear. The Guidelines emphasize the importance of a cyclical framework of data collection, research and monitoring to quantify and reduce the incidental mortality of seabirds in an adaptive manner. 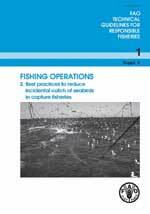 The Guidelines cover the following topics: (i) extend the IPOA–Seabirds to other relevant fishing gears including trawls and gillnets; (ii) uptake of seabird measures by RFMO/As; (iii) defining an incidental catch problem; (iv) mitigation measures and related standards; (v) mitigation research; (vi) education, training and outreach; (vii) observer programmes; (viii) seabird incidental catch reduction objectives; (ix) monitoring and reporting framework for NPOA–Seabirds and regional plans; and (x) periodic performance review.